As a publisher of electronic titles, we accept submissions in Microsoft Word .doc or .rtf formats. Ninety-nine percent of submissions come in as .doc files. Since all of our editors use this program, this is not a bad thing, but I continue to notice that there are a great many who don’t know some Word basics that would/could make the editing process a lot easier. And let’s face it, authors, you haven’t submitted your manuscript just to get a rejection, right? So here are some basic things that will make the editing process run smoothly. Number one is a “must do” in my opinion. I see this all toooooo often. Number Two makes things easier for you in the long run, because it’s going to be you, and not your editor, who has to put back all those lost italics. The rest is an FYI. Making proper page breaks. As most (all) of you know, Word automatically adds a page as you complete the previous one. So all you have to do when writing is type, type, type, and Word creates pages for you. However, what do you do when you come to the end of Chapter One and you’re only halfway down the page? You need Chapter Two to begin on a new page. Here’s what I see a lot of: return spaces down the rest of the page until Word automatically pops in a new page. This is not the way to do this. It creates more problems than you can imagine. The main one being, when you edit Chapter One, if you delete or add lines, it affects the lines on Chapter Two. If Chapter Two started 1/3 of the way down the page, and you remove five lines from “Chapter One,” guess what? Chapter Two now begins less than 1/3 of the way down. The way to create a hard page break is to hold down the CTRL key when pressing ENTER. (CTRL+ENTER) creates a hard manual page break. Voila! Now, Chapter Two will always begin one page after Chapter One, regardless of your edits. Special formatting. Can I just say three words about this, please? Don’t do it! OK, technically, that’s four words. 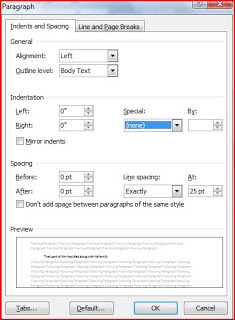 Special formatting is a wonderful tool when preparing work for print, or for finalizing electronic copy. In fact, we use special formatting in our production department to help ensure that our chapter headers and scene break markers, etc. are consistent throughout every manuscript. But, when we get a manuscript in that has used special formatting, we have to removed the special formatting the author has employed. The way we do this is to completely strip all formatting by turning the file into plain text or by clearing the formatting (sometimes clearing the formatting doesn’t work, and the plain text option has to be used). The result in either case is the same. All italics, bold, etc. are lost. So, don’t use special formatting. In fact, make it a habit to have all your text fall under the “Normal” style. When you need your “Normal” style text to be italicized, simply click the italic button (CTRL+I will toggle the italics on/off, also.) The way you can tell if you’ve done this correctly is, when your cursor is in the middle of your italicized text, or you highlight your italicized text, the style box will now say “Normal + Italics.”Formatting this way will ensure that production doesn’t have to strip your italics or bold, etc. when getting your manuscript ready for release. Tabbing a paragraph indent. I consider this one a “middle ages” kind of a thing–like double spacing at the end of a sentence. Double spacing at the end of a sentence was something that was necessary when we all used typewriters (some of you will remember those 🙂 ) so that there was a distinct separation between sentences. Computers make this practice obsolete. Likewise, the tabbed indent. Word has a nifty little paragraph helper calle d a special indentation. Right-click on your page (anywhere on your page) and choose “Paragraph” from the menu. A box will pop up, and under special (the highlighted part of this image) choose “First Line” from the dropdown. Now, whenever you make a hard return (hitting ENTER at the end of a line), the next line will automatically be indented. Voila! No more need to tab. On an additional note, don’t use a Left or Right indentation, either (see the settings in the image–to the left of the “special”). Solely using the First Line indent will suffice and not cause problems with formatting later. Section Breaks. Same three–technically four–words. Don’t do it. There is a time and a place for section breaks, but in a raw manuscript, I don’t know why you would use them. Page breaks (see Number One) are good enough. Even if you are submitting an anthology, and for some reason, have all the stories in one document, I would recommend just separating them with a title page in between each story. Some publishers may have specific instructions on this, but for generality’s sake, don’t use section breaks. They don’t create such a problem as having to clear special formatting, but avoid them whenever possible. Inserting images/boxes for page numbers. Sometimes, we get manuscripts where the author has placed the page number in a text or image box within the header or footer. This sometimes causes issues with formatting later. Just insert a plain page number. No text boxes, no images, just plain-ol’ plain-ol’, please. LOL, Wendy. I think we've done pretty well so far. JoAnn: There's still so much about WORD that I need to figure out!